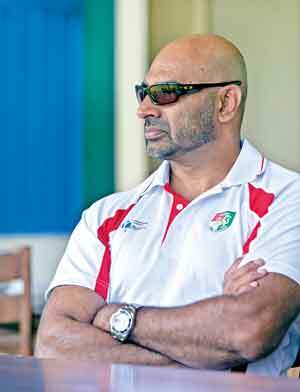 Sri Lanka’s chief cricket selector Graeme Labrooy is of the opinion that cricket is mainly a game of self confidence and through the approach of new cricket Coach Chandika Hathurusinghe, who has taken the reigns for four years, Sri Lanka’s national cricket is well on its way to recovery. Speaking exclusively to the Sunday Times on Sri Lanka’s next phase and if the side is moving towards taking up the challenge for the 2019 World Cup, Labrooy said, “We are getting ready for the World Cup 2019. Coach Hathurusinghe’s focus is nothing but the World Cup and at the same time, he wants to breed Test players using the T-20s to be in the squad for the World Cup, in twelve months time. Talking about the ideal composition Labrooy said, “We had Kusal Mendis opening the batting once again. This is the strategy adopted by the coach because these matches were played in Asia and on turning tracks. But, on quicker bouncy tracks Mendis won’t be opening. He will go either three or four.” He said these are the strategies that we are adopting. We pointed out that with Roshen Silva batting so well now it’s becoming a problem to select the batting line-up. To that Labrooy said, “That is in the longer version of the game and that part of the job has been entrusted with Dinesh Chandimal – that is not an issue that is established. But, still we are looking at the ODIs and the T-20s. However Labrooy said that fast bowler Dhammika Prasad who was Lanka’s premier strike bowler had still a way off, while Kaushal Silva was given the opportunity, but failed to grab the opportunity. “We asked Kaushal to score runs and come back and he has done that now and he has to come back. But, once you keep the door opened which has brought in Dhananjaya de Silva and he is scoring a lot runs. Kaushal’s is a specific place – if you to pick him you have to pick him as an opener. May be the earlier message of hanging on to one end does not work anymore even in Test cricket. They have batsmen who score from both ends – if you don’t punish a bowler he gets on top of you. The good old style of holding on to one end does not work anymore. On the whole within the next six to eight months the squad would go on a trial-and-error basis and eight months before our World Cup we will have our squad for the 2019 World Cup. Right now we have about twenty in our mind and the fifteen will come once we are certain. Nizam Packeer Ali – Cometh the hour, cometh the man!